I’m going to be honest with everyone here; I don’t think hell really exists. I think it was more likely an ancient form of mind control that has stayed in the heads of enlightenment sceptics. It’s only an opinion, but I think heaven and hell have all the credibility of the tooth fairy. However, if I am proved wrong and there is such place, I couldn’t think of anywhere better for Boris Johnson, Jacob Rees Mogg, John Redwood and all the other ERG nutjobs intent on smashing the British economy to bits. Let’s have a look at that quote. Go on then, tell me what is wrong with that? Apart from it being true in a world where the truth is inconvenient, it was just about bang on the money. My only disappointment is hell probably doesn’t exist; otherwise Boris Johnson would be set to burn for eternity. In many ways, Jacob Rees Mogg is worse than Johnson. At least Johnson doesn’t hide behind God when he is taking backhanders. He doesn’t claim that God guided him to cheat on his wives and knife colleagues in the back and front. He doesn’t claim the sweet Virgin Mary gave birth to the Lord Jesus Christ so he could leave a British woman stranded in a Tehran prison cell. Johnson probably knows that if hell exists, he is fucked. Jacob Rees Mogg on the other hand, is on the make by every deplorable means, yet still has the audacity to be religiously righteous. Where in the Bible is greed, tax avoidance and utter disdain for the poor, mentioned? I have to admit at this point, I have not read much of the Bible, so I am not an expert. However, the bits I remember from school didn’t say ‘Thou shalt bleed thou nation dry by disaster capitalism’. Neither, as far as I am aware, did it say ‘Thou shalt syphon thou dirty cash to offshore tax havens’. In Rees Mogg’s mind, all his of his evil traits are acceptable just as long as he proves what a good Christian he is. Maybe he justifies his behaviour via the confession box? “Good morning Father Patrick, I’m afraid I have sinned”. If I was a Christian, I would be ashamed of Rees Mogg. Don’t forget this is the man who deplores raped women having abortions whilst profiting from abortion pills. He also failed to criticise Johnson for a catalogue of appalling behaviour that the Devil (if he existed) would see as a major threat to his position as Hell’s Managing Director. The Devil would be right to feel threatened as well. Johnson would set fire to his own kids if there was something to be gained from it (although he would have to get his butler to point them out, in case he got the wrong ones). Johnson doesn’t know how to be decent; it is utterly beyond him. 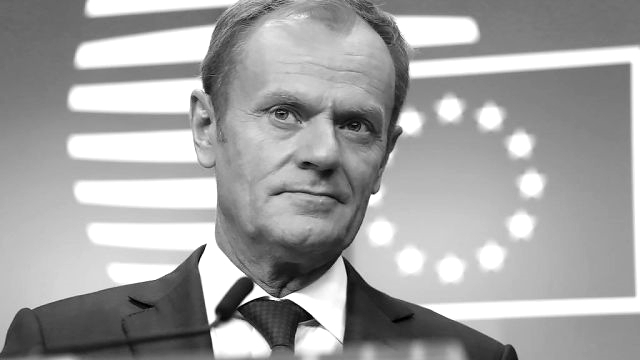 As far as I am concerned, Donald Tusk didn’t go far enough. Hell (if it existed) is nowhere near a bad enough place for people with an ideology that, for their own grubby gain, would tank the economy. An ideology that would leave every public service (including the NHS) open to the highest bidder. As far as these 50 or so bastards (to coin a John Major phrase) are concerned, ordinary folk who haven’t had the advantages of excessive privilege and an Old Etonian old boy’s network, can do one thing. They can rot in heaven. If heaven doesn’t exist, a ditch will do. No Replies to "God Save Donald Tusk"